Almost any PC made in the last few years will be a x86_64 bit computer. If you have an older computer around that isn’t being used then it will most likely have the right CPU and amount of memory to run a basic server. Throwing a SSD in one of these older computers will provide an excellent server experience for small and larger player counts. The Intel compute stick is just a little bit bigger than a USB flash drive and is powered by Micro USB. I developed this entire script and guide using one. This is a cheap mini PC that has 2 GB of RAM and comes preloaded with Windows 10. I would just blow away the Windows 10 installation and put Ubuntu Server on there. This is a full blown PC in Micro ATX form that uses much less power and takes up much less space than a traditional ATX or Mini ATX PC. Warning: This is the absolute highest price point you want to go before it makes much more sense to just buy a used PC off eBay or local listings. You should be able to find a PC with 4-8 GB of RAM used for less than $250. The upside of this option is that you are covered by manufacturer’s warranty and have support if needed but above this price point it’s easier to just buy a different used one if you start having problems! I have a couple of these little Optiplex towers running VMs and other server applications and they have been fine and the Linux support is good. At the time of writing the current version is Ubuntu Server 18.04.2. This is a secure and robust operating system and will leave plenty of resources available for the server to run. The script should run on any Debian based flavor of Linux but since the Minecraft Bedrock server is compiled natively for Ubuntu I recommend sticking with it. If you have a GUI flavor of Ubuntu and a decent PC (>= 2 GB of RAM) the server will work just fine on it. Download the image and write it to a USB drive. If you are on Windows Win32DiskImager is a easy to use program to do this. Now boot the computer from the USB drive and follow the installation instructions. Make a note of the IP address during installation or alternatively log into your home router and see what IP address the machine was assigned. You’ll need this later to connect to the server from the Minecraft client. “Start Minecraft server at startup automatically (y/n)?” – This will set the Minecraft service to start automatically when your server boots. This is a great option to set up a Minecraft server that is always available. “Automatically restart and backup server at 4am daily (y/n)?” – This will add a cron job to the server that reboots the server every day at 4am. This is great because every time the server restarts it backs up the server and updates to the latest version. See the “Scheduled Daily Reboots” section below for information on how to customize the time or remove the reboot. The server will start up and start displaying output to the console. [2019-03-30 20:25:23 INFO] Server started. Once you see the “Server started” line you will be able to connect from the client. To add the server to the client open Minecraft and click “Play”. Then at the top of the screen select the “Servers” tab and click “Add Server”. This will ask you for a Server Name and Server IP Address. For the name you can put anything and for the server IP address put the address of your Linux server. Leave the port as the default 19132. For more information on how to let people from outside your network on go to the “Port Forwarding” section below. Now choose the server you just added in the list and connect! Your world has now been restored! It’s a good idea to download these backups off the server periodically just in case the server’s storage fails. You want to forward port 19132. The type of connection is both TCP and UDP. On some routers you need to do both a TCP entry and then a second entry as UDP. Once you do this people will be able to connect to your Minecraft server through your public IP address. This is different than your local IP which is usually a 192.x.x.x or 10.x.x.x. If you don’t know what that is just go to google and type “what’s my ip” and Google will kindly tell you! The Minecraft Bedrock Edition dedicated server runs much better than previous third party servers in the past that were missing critical features. The performance is very good even on low end hardware. 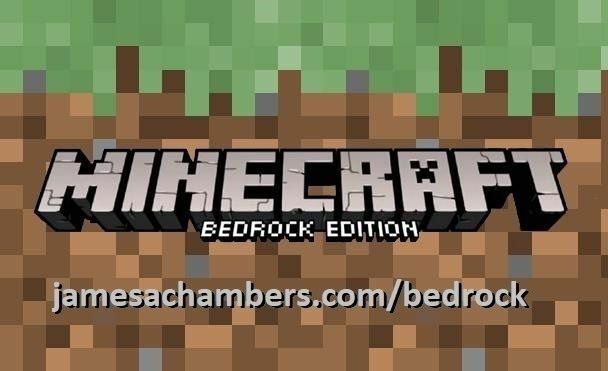 It has never been easier to set up a Minecraft Bedrock server. If you have any feedback or suggestions let me know in the comment section. A lot of the changes and developments in this script and guide are directly from readers. Worked perfect! Screen threw me off until I figured out the commands… question, is it possible to run multiple worlds? It’s definitely possible to run multiple worlds. The easiest way would be to create a copy of the folder and then change the ports in server.properties to different ones. If you don’t want to run the different worlds at the same time you can also look in the “worlds” folder. These can be switched to by changing the world in server.properties or moving/renaming the folders. Let me know how it goes. I could definitely look into adding support into this natively in the script if there’s some interest!